Sunday afternoon at YBCA Theater saw the final dance of San Francisco Performances’ 2016-2017 season. 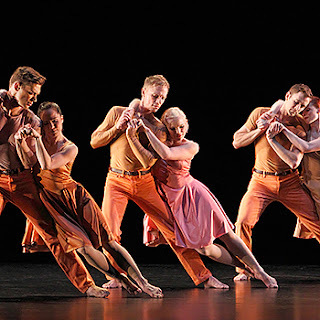 This honor was held by the Paul Taylor Dance Company, a frequent returnee to and favorite of the longtime Bay Area presenter. Program C was a throwback to Taylor’s choreography from decades past with a triple bill of Danbury Mix (1988), Ab Ovo Usque Ad Mala (1986) and Esplanade (1975). I really enjoy the classic American modern dance style, and with the exception of a few companies, you don’t see it that much anymore. There’s a purity and unfetteredness to the form that is still both creative and relevant today. Flexed hands, sculptural pictures and Graham temps leveé; emotionally charged themes - all so clear and defined. Choreographically, Program C’s opener, Danbury Mix, was very reflective of this genre’s clarity, though the piece’s narrative was less so. The cast, costumed in black, began in a cluster upstage left. Quickly a Miss Liberty character (beautifully danced by Laura Halzack) emerged through the group. Ominous and foreboding music framed the scene, the group moving along the diagonal and then to the center of the space. Over the work’s twenty-four minutes, you could tell that there was a strong narrative at play – maybe not a linear story, but certainly the dance was about something or reflecting something. The question was what? Mostly, I saw an examination of extremes, that between chaos and control. Carefully controlled attitudes and arabesques, stylized walking and relevé fouettés in parallel countered with frenetic pulsating and animalistic crawling. Purposeful onstage panic would abruptly give way to a sudden calm and tranquility. And then the energy would transform again, into jubilant, patriotic-inspired phrase material; sometimes things got even a little campy. It just seemed like there was more going on than just a statement on chaos and control in Danbury Mix’s narrative, but it didn’t read as clearly as did the choreographic form.